Chicago was incorporated as a city in 1837 and had at the time a population of some 5,000 inhabitants. Between 1840 and 1844 about twenty Jews settled in the city, most of them immigrants from the German regions of Bavaria and the Palatinate. On October 3, 1846, fifteen Jews founded the first Jewish congregation in the city, Kehilat Anshe Maarav (The Congregation of the People of the West), subsequently referred as K.A.M. They practiced the traditional Minhag Ashkenaz and worshiped in a room above a clothing store. By the middle of the century, ten additional community organizations came into being, which operated until WW2. In 1861 the Reform congregation Sinai was founded. At this time Russian and Lithuanian immigrants from Eastern Europe began to arrive in the city. They spoke Yiddish and peddling was their chief occupation. As early as the autumn of 1862 the Eastern European Jews organized congregation B’nai Jacob, and a year later, Beth Hamedrash Hagodol. In 1867 both congregations merged under the name Beth Hamedrash Ub’nai Jacob. Synagogue in Allbany Park, Chicago 1981. Photo: Joel Granoff, U.S.A. When the American Civil War began, the Jewish community in Chicago had grown to such an that it was able to recruit a complete company of a hundred Jewish volunteers to join the 82nd Illinois Volunteers. The Jewish community of Chicago quickly recovered from the great fire of 1871, which affected the neighborhood of the German Jews, and from the fire of 1874, which affected mostly East European Jews. The neighborhood of the Russian and Polish Jews received the cognomen “The Ghetto” and that of the German Jews “The Golden Ghetto”. In the 1860s German Jews began to enter the medical and legal professions, some also went into banking, even founding Jewish banking houses. The new Russian immigrants of the 1880s preferred factory work and small business. The greatest number of them, 4,000 by 1900, entered the tobacco industry, primarily the cigar trade. 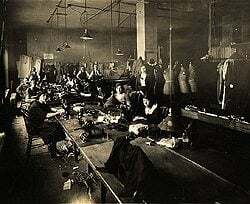 The growth of sweat shops in the needle trade in the 1880s with their unsanitary conditions and excessive hours were the determining factors in the development of the Jewish Socialist movement and the Jewish trade-union movement. The Chicago cloak-makers union, predominantly Jewish, was the first to protest against child labor, which persisted despite compulsory education. They succeeded only in establishing a 14-year old age limit and limiting any sweatshop to the members of one family. It was the strike in 1911 that established collective bargaining in the clothing industry. It laid the foundations for a new and lasting union, the amalgamated clothing workers of America. An alternative to sweat shops and peddling was provided for a few by the Jewish Agriculturists Aid Society of America, founded in Chicago in 1888. From the 1880s to the 1920s the Jewish Population Grew from 10,000 to 225,000, or from 2% to 8% of the general population. From the 1930s to the 1950s, Jews relocated their residences to the northern part of the city and in the suburbs to its north. In 1969 West Rogers Park and suburban Skokie were the largest Jewish communities, each with a Jewish population of 50,000, constituting about 70% of the total population of the area. To a considerable extent the development of these new communities with religious, educational, cultural, and social service facilities was the result of a conscious effort to perpetuate Jewish group cohesion. Community leaders held the opinion that a modicum of Jewish education and voluntary segregation in a high-status residential area would forestall assimilation. 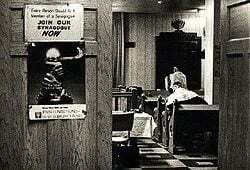 In 1961 Chicago had 43 Orthodox synagogues, 25 Conservative, 16 Reform, and five traditional. The Chicago Board of Rabbis, supported by the Jewish Federation and Jewish Welfare Fund, sponsored all programs of Jewish content on radio and television, and the Chaplaincy Committee, which served hospital and penal institutions. During the 1960s there were also three mikvaot, two Battei-Din (Rabbinical courts) – one Orthodox and one Conservative. The Battei-Din were concerned primarily with issuing religious divorces (gittin) and conversions. In 1969 it was estimated that about 15% of the Chicago Jewish Community was foreign-born and about 5% still used Yiddish as their vernacular. About 3% to 5% were strict Shabbath observers, but synagogue affiliation was less than 50% in the city and about 60% in the suburbs. Workshop for women’s Clothes, Chicago, USA, c.1920. Sitting, first left: Sara Cohen, nee Gewirtz. Beit Hatfutsot, the Visual Documentation Center; courtesy of Aharon Kanot, Kfar Givton. In 1968 the Jewish Federation and the Jewish Welfare Fund of Metropolitan Chicago, including the United Jewish Appeal, united as the Jewish United Fund of Metropolitan Chicago. In addition to national and overseas aid, the Jewish United Fund served many communal Institutions, such as the Family Community Service, child development and day-care centers, and medical centers. There have been two Jewish hospitals dedicated in 1881, and Mount Sinai, founded in 1918 as a successor to Maimonides hospital, which had been incorporated in 1910. Many Jews have occupied high government positions, both locally and nationally, among them Arthur Goldberg, former Justice of the United States and ambassador to the United Nations. The social and cultural integration of Chicago Jews into the life of the city is best illustrated by the fact that the presidents of three institutions of higher learning in 1970 were Jewish. A bibliography of Hebrew and Yiddish publications published in Chicago between 1877 and 1950 shows 492 titles. The Yiddish press in Chicago was most prolific. The Hebrew press in Chicago was not as successful as the Yiddish press. It made its debut in 1877 with the weekly Heikhal Ha-Ivriyyah, which was a supplement to the Israelitishe Press and was published until 1879. Keren Or, a monthly followed in 1889. In 1897 the weekly Ha-Pisgah made its appearance, and was replaced in 1899 by the Ha-Techiyyah. The first Jewish periodical to appear in Chicago was the weekly Occident in 1873, which continued publication until 1895. In 1969 there was one Anglo-Jewish weekly, The Sentinel, founded in 1911, A Chicago edition of The Jewish Post and Opinion, The Chicago Forum, a quarterly, founded in 1942, and The Jewish Way, appearing before every major Jewish holiday, founded in 1948. In 1999 the Jewish population of Greater Chicago Area (all of Cook and DuPage counties and a portion of Lake County) was estimated at 261,000 inhabitants being the forth largest Jewish center in the USA. There are numerous agencies, organizations, institutions taking care of every aspect of Jewish life, from family and community support and senior assistance through religious needs, health care, cultural activities, and education, up to volunteer work and charity. The community is deeply involved in the life of the American Jewry and indeed its impact is felt far beyond all over the Jewish world, including Israel. Some 30,000 Jewish immigrants from the former Soviet Union choose to settle in Metropolitan Chicago during the last 25 years. Many received the assistance of the Jewish Federation at the start of their new life in the USA. Strengthening the Jewish identity, assuring its continuity while preserving its rich heritage is one of the main concerns of the Jewish Federation. The Jewish Federation’s total allocations on education amounted to more than 20% of the total thus emphasizing its important role in maintaining Jewish life during the coming generations. Jewish education in Greater Chicago area is advanced by a large number of schools and informal educational institutions providing various courses and programs for children of all ages as well for youngsters and families. They all have in common a desire to promote Jewish values and heritage, to stimulate new Jewish creativity and to help preserve a distinct Jewish identity while preparing the younger generations towards the challenges posed by a constantly changing society. The various educational options are provided by many Hebrew, Sunday and day schools, and also numerous informal institutions for adults and families encompassing programs as diverse as day care programs, higher education, and camps and summer schools.Chicago is the home of the Hebrew Theological College, Yeshiva High School and Teachers Institute, The College of Jewish Studies, a branch of the Telz yeshivah, The Chicago Jewish Academy. Primary day schools include the Akiba-Schechter Jewish Day School, the Kinderland/Hebrew Academy, the Sephardic Hebrew Day School, and Hillel Torah North Suburban Day School, and of the secondary day schools, mention should be made of Ida Crown Jewish Academy and Bais Yaakov High School of Chicago, among others. Sachs-Skora Community Hebrew School, Consolidated Traditional Hebrew School are only two of the many Hebrew Sunday schools that function in the Greater Chicago area. Family education is promoted by a number of institutions, among them the various Jewish Community Centers of Chicago, the Marvin N. Stone Centre for Jewish Arts & Letters, the Spertus Institute of Jewish Studies – a liberal arts college. Spertus also houses the Zell Holocaust Memorial whose resources help children and adults to better comprehend the Holocaust. The Jewish periodicals published in Chicago includes the weekly Chicago Jewish News with an online edition, the fortnightly Chicago Jewish Star distributed free of charge – both based in Skokie, The quarterly Jewish Community News that has started its publication in 1941, and the annual JUF News & Guide to Jewish Living in Chicago published jointly by the Jewish United Fund and the Jewish Federation of Metropolitan Chicago. Jewish Image is a monthly family magazine based in Chicago and is distributed free of charge all over United States. Kosher Consumer is published by the Chicago Rabbinical Council six times a year and contains information on kosher products. • Jerusalem Online – WCFC-TV 38, is a half-hour magazine broadcast from Jerusalem on Fridays at 20:00 and rebroadcast on Sundays at 13:00. Sanctuary – WLS-TV7, is a talk-show focused on Jewish issues and produced by the Jewish Television Commission – a joint venture of the Jewish Federation and of the Chicago Board of Rabbis. • The Torah Radio Network broadcasts an array of programs on Jewish issues. • Israel News by Phone – 847-679-9374, offers daily updates Sunday through Friday, in English, from the Israeli Arutz-7 radio station. • The Moshe and Esther Brandman Memorial Tape Library makes possible to listen to edifying and informative lectures by Torah scholars. The religious needs of the Jews living in the Greater Chicago are served by numerous of institutions, organizations, and synagogues belonging to all Jewish movements. All other aspects of Jewish life, like kosher food, mikveh, Bar and Bat Mitzvah celebrations, to list only a few are provided by the various congregations and by the Jewish Federation. Jewish Burial Society and Chicago Jewish Funerals provide Jewish funerals, among others. 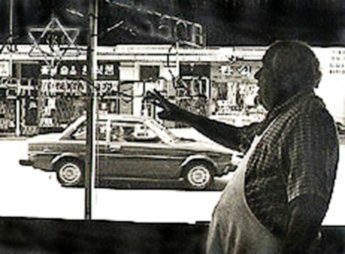 Kosher Butchery, Albany Park, 1981. Photo: Joel Granoff, U.S.A. Religious life is coordinated by the Chicago Rabbinical Council which takes care of the different aspects and necessities of Orthodox Judaism and by the Union for Reform Judaism – Great Lakes Council – Chicago Federation for Reform Judaism. The United Synagogue of Conservative Judaism (USCJ) oversees the activities of the Conservative congregations setting guidelines for their social, educative, and religious programs. Of the Conservative synagogues a special mention should be made of the veteran Anshe Emet Synagogue located in the Lakeview neighborhood and which represents a landmark in the Jewish history of Chicago. Other Conservative congregations include West Suburban Temple Har Zion in River Forest, Congregation Am Chai in Hoffman Estates, Congegation Rodfei Zedek, and B’nai Emunah in Skokie. Temple Menorah, Emanuel Congregation, and Congregation Or Chadash in Chicago belong to the Reform movement as well as Temple Beth Israel in Skokie, Congregation B’nai Jehoshua Beth Elohim in Glenview, and Congregation B’nai Yehuda Beth Sholom in Homewood, to name only a few of the more than 20 Reform temples located in Metropolitan Chicago. Among the Orthodox synagogues Congregation Adas Yeshuron Anshe Kanesses Israel and Anshe Sholom B’nai Israel are located in Chicago and Congregation Or Torah is situated in Skokie. Skokie also has a Reconstructionist congregation – Ezra Habonim: Niles Township Jewish Congregation, additional Reconstructionist congregations are located in Evanston – Jewish Reconstructionist Congregation, in Naperville – Congregation Beth Shalom, and in Northbrook – Shir Hadash Reconstructionist Synagogue. Within the framework of the Partnership 2000 project that strives to establish and develop close relationships between Jewish communities in the Diaspora and Israeli towns and villages, the Jewish Federation and the Jewish United Fund in Chicago are connected with the Lachish area in the Negev region of Israel providing its inhabitants with assistance in development as well as with an informal opportunity to foster direct contacts between the two communities. On November 10-15, 2000, the Jewish Federation of Chicago hosted the annual General Assembly (GA) of the United Jewish Communities when some 5,000 delegates who gathered from US, Canada, South America, Israel and Europe.